Today in Masonic History Edward Ferdinand Arn is born in 1906. Edward Ferdinand Arn was an American politician. Arn was born in Kansas City, Kansas and lived there growing up. He would attend Kansas City Junior College, University of Kansas and the Kansas City School of Law. Arn would practice law in Wichita, Kansas after graduation. He would enlist in the United States Navy during World War II and would serve on one of the aircraft carriers that fought during the battle of Iwo Jima. After the war, Arn returned to his law practice. He would also become active in local politics first serving as the Chairman of the Wyandotte County Republicans. In 1947 he would begin a two year term as Kansas' Attorney General. In 1949 he would become an associate justice on the Kansas Supreme Court, leaving the position in 1951. Arn was elected as Governor of Kansas for two terms. The first was in 1950 and the second time was in 1952. 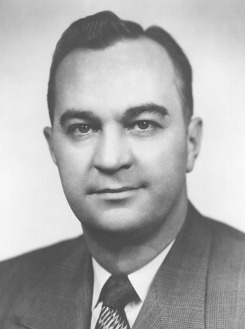 His years in office were from 1951 to 1955. He would be the first Governor of Kansas to be born in the 20th Century. During Arn's tenure as Governor the Kansas Turnpike Authority was established, workman's compensation benefits were improved, the Kansas Veteran's Commission was formed and a state department of Administration was organized. During Arn's first year in office, 1951, historic floods hit Kansas which Arn led the state through. When Arn left the Governor's office, for a brief time, he returned to his law practice. In 1960 he ran, unsuccessfully for the United States Senate from Kansas. He would run unsuccessfully again in 1962. Arn would pass away in Wichita on January 22, 1998. Arn was a member of Wyandotte Lodge No. 3 in Kansas City, Kansas.